From the time I started the 7th grade, I have had an intense love for makeup, but up until the last 6 months or so, I was never particularly good at applying it. My foundation was always cakey. I never knew how to cover up my blemishes properly. I could never figure out how to apply gel eyeliner. And don’t even get me started on my eyebrows. But thanks to the wonderful world of YouTube, I have discovered a ton of fabulous makeup tips and tricks that have not only made my face look more flawless and professional, but that have also made me feel more confident in my own skin. And since I love sharing all of the things I learn with my gorgeous readers, I decided to put together a collection of the makeup tips that have made the biggest difference in each part of my makeup routine (foundation, eyeshadow, eyebrows, etc.). I hope these makeup tips help YOU as much as they’ve helped me! 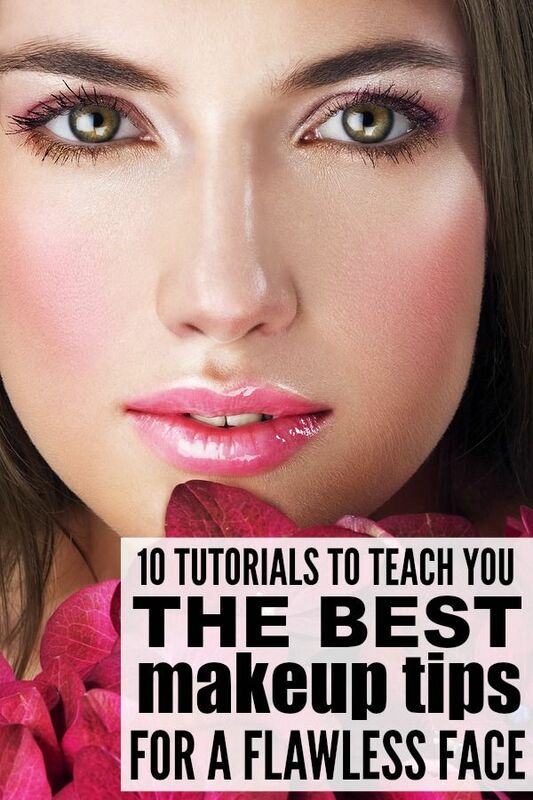 I learned a ton of great tips from this tutorial, the most important of which is to apply my foundation AFTER my eyeshadow, eyeliner, and mascara. I am prone to getting eye makeup all over my cheeks, so this has really made a difference in making me look more polished. I also love Jaclyn’s tips for making my concealer flow with my foundation, and I could NOT survive without my Beautyblender! This tutorial really helped me when I was first trying to master the world of eyeshadow, and I highly recommend it as it’s filled with all kinds of great tips to teach you about eyeshadow primers, brushes, eyeshadows, application techniques, and more! If you struggle to applying eyeliner properly, you will LOVE this tutorial. I especially love the Q-tip trick as I am notorious for pulling my eyelids taunt while applying eyeliner and I didn’t know this little habit of mine can cause premature sagging! I have always loved Jaclyn’s eyebrows, and while I’ve been using the Anastasia Beverly Hills Brow Wizfor MONTHS, I was never able to get my eyebrows to look even remotely like hers until I watched her updated brow routine. This tutorial has lots of great little tips, but the concealer trick and theAnastasia Beverly Hills Clear Brow Gel have made SUCH a difference for me! Prior to watching this tutorial, I always assumed the right technique for applying blush was to smile, but after trying out Wayne’s techniques, I realized I was doing it all wrong. I prefer applying my blush in a circular motion with an angled brush because I feel like it makes my face look longer and more defined, but give all of his techniques a try to find out what works for you and your face shape. I always knew to apply 2 different types of mascara to make my lashes look voluminous, but I didn’t know which mascaras to use, or which techniques worked best. But thanks to this tutorial, my eyelashes look AMAZING. I’ve tried a ton of different mascaras over the years, and I’m currently crushing on theL’oreal Voluminous Mascara and Maybelline New York The Falsies Volum’ Express Washable Mascara. I was always WAY TOO SCARED to try false eyelashes, but this tutorial totally changed my mind. I ordered myself a pair of Strike a Pose Velour Lashes based on Jaclyn’s recommendation, and I am so glad I did. They look amazing, they last forever, and thanks to the tips in this tutorial, they are so easy to apply! If you have a big night out planned and really want to transform your face, Wayne Goss has you covered. This tutorial gives you step-by-step instructions on highlighting and contouring, and the finished look is to die for! I was so excited when I saw this tutorial because I absolutely LOVE all of Wayne’s makeup tips as they are quick, easy, and make a HUGE difference in my makeup routine. I particularly like his tricks for applying mascara to the lower lash, highlighting eyebrows for a more defined look, controlling an oily face, and testing lipstick. There are 22 tips in total in this tutorial – you’re going to love it! This is a really fun tutorial as Carli does her makeup correctly on one side of her face, and purposefully makes makeup mistakes on the other side. She shares lots of great tips and tricks along the way, and really demonstrates the importance of applying makeup PROPERLY!